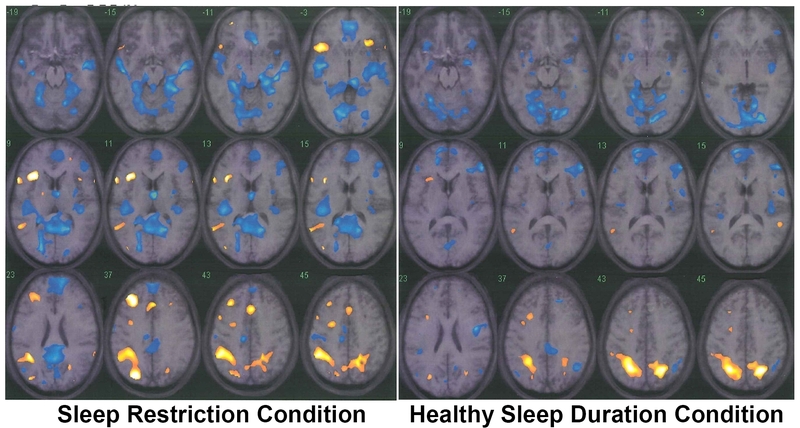 Here we report preliminary findings from a small-sample functional magnetic resonance imaging (fMRI) study of healthy adolescents who completed a working memory task in the context of a chronic sleep restriction experiment. Findings were consistent with those previously obtained on acutely sleep-deprived adults. Our data suggest that, when asked to maintain attention and burdened by chronic sleep restriction, the adolescent brain responds via compensatory mechanisms that accentuate the typical activation patterns of attention-relevant brain regions. Specifically, it appeared that regions that are normally active during an attention-demanding working memory task in the well-rested brain became even more active to maintain performance after chronic sleep restriction. In contrast, regions in which activity is normally suppressed during such a task in the well-rested brain showed even greater suppression to maintain performance after chronic sleep restriction. Although limited by the small sample, study results provide important evidence of feasibility, as well as guidance for future research into the functional neurological effects of chronic sleep restriction in general, the effects of sleep restriction in children and adolescents, and the neuroscience of attention and its disorders in children. Inadequate sleep is endemic among adolescents in developed countries. Whereas clinical recommendations call for about 9 hours of nightly sleep in healthy adolescents , nearly half sleep less than 7 hours each school night . Adolescent sleep restriction results in daytime inattention , but the neural mechanisms that underlie this effect remain unknown. In adults, functional magnetic resonance imaging (fMRI) studies have shown that acute sleep deprivation can alter the activation patterns of two attention networks. In well-rested adults, the "task positive" network, which includes portions of the prefrontal cortex and posterior parietal lobes, shows more activity during a variety of tasks that require active allocation of attentional resources than during control tasks that require less mental engagement (e.g., "rest" periods or a simple perception task) [4, 5]. In contrast, the "task negative" network, which includes the medial frontal lobes and posterior cingulate, is typically less active during attention-demanding tasks than control tasks [4, 5]. Although some findings appear task-specific, when sleep-deprived adults perform normally on attention-demanding tasks, the divergent activation and deactivation patterns in task positive and task negative networks typically become even more pronounced [6–12], but when they perform poorly, this divergence is attenuated [6, 7, 12–16]. The former is believed to reflect a compensatory response to the burden of sleep deprivation on these networks, whereas the latter represents a breakdown in that response [6, 8, 11]. Although intriguing, these findings have been limited to adults, and may not generalize well to adolescents. Whereas adolescents often experience chronic partial sleep restriction (i.e., obtaining inadequate sleep across several consecutive nights), past fMRI studies have used 1- and 2-night complete sleep deprivation protocols. Moreover, adolescents are often asked to attend to tasks at a time much closer to their circadian nadir than adults because of early school start times and a delayed sleep phase . Developmental shifts in the homeostatic sleep drive  may also affect adolescents' response to chronic sleep restriction. We recently documented the feasibility and behavioral effects of experimental chronic sleep restriction in healthy adolescents . Here we report pilot data on a subsample from that group who underwent fMRI examination while they completed a working memory task known to require effortful attention and to conform to the task-positive/task negative functional activation model. The experimental protocol and sample used for this study are detailed in Beebe et al. . Briefly, healthy adolescents underwent a 3-week protocol which included a baseline week, followed in random order by a sleep restriction week (SR) and a healthy duration week (HD). Wake time, which did not significantly vary across the three weeks, was established as the time each subject would need to arise to attend an 8:30 am meeting. In contrast, bedtimes were systematically varied. Subjects self-selected their bedtimes during the baseline week, which was intended to stabilize subjects' sleep phase prior to any experimental manipulation. On the Monday-Friday nights of the SR week, subjects set a late bedtime that limited them to 6.5 hours in bed; on the Monday-Friday nights of the HD week, bedtime was set earlier to allow 10 hours in bed with lights out. Saturday and Sunday nights were considered "washout" periods, during which bedtime was subject-selected. Sleep was monitored via objective actigraphy and self-report. We intended to study 10 of the 20 subjects from the larger study, but obtained complete fMRI data on 6 due to equipment malfunction for 2 subjects, 1 falling asleep mid-scan, and 1 who misunderstood task instructions. These 6 subjects (mean age = 15.3 ± 0.7 years; 4 males) averaged 2 1/2 hours more sleep per night (range 1.7 – 3.0) in the HD condition than the SR condition (Table 1). On study-specific questionnaires , these subjects also self-reported much quicker sleep onset at night and greater difficulty waking in the morning, and parents reported observing greater daytime sleepiness and inattentive behaviors, during the SR week. †p < .10; *p < .05; **p < .005, ***p < .001 comparing the SR vs. HD sleep conditions. These findings are comparable to those shown in the full sample of the parent study. See Beebe et al. for a full description of the parent study, including sleep and behavioral measures. Between 9 and 11:30 a.m. on the Saturday mornings at the end of each experimental week, subjects completed a computerized n-back task while undergoing fMRI monitoring. We chose an n-back task because such tasks allow for strong discrimination between basic perceptual/motor demands versus higher-level demands placed on attention and working memory, resulting in well-established functional activation patterns that conform to the task-positive versus task negative network model . In the n-back task we used , subjects viewed numbers from 1 to 4 that consistently appeared in one of four visual quadrants. In the "0-back" control task, subjects were to press a button to match each stimulus as it was presented. In the "2-back" task, subjects indicated the stimulus that appeared two steps earlier. Stimuli were presented in a periodic block-design paradigm in which 30 second intervals of the two conditions were interleaved beginning with a block of the control task followed by 5 blocks of each task. Within each block, 17 stimuli appeared (ISI = 1.7 sec, 0.2 second blank screen between stimuli); preceding each block there was a 3 second visual warning of the change in task (total task duration: 6 min, 3 sec). Scans were performed on a Bruker Biospec 30/60 3T MRI scanner (Bruker Biospin, Ettlingen, Germany) (n = 4) and on a Siemens Trio 3T scanner (Siemens AG, Munich, Germany) (n = 2). Activation patterns and n-back performance were very similar across scanners, so data were pooled for group analyses. Both scanners used a T2*-weighted, gradient-echo, echo planar imaging sequence for the fMRI scans (TR = 3000 ms, TE = 38 ms, FOV = 25.6 × 25.6 cm, matrix = 64 × 64, 25 5-mm axial slices). A high-resolution, T1-weighted, inversion-prepared MDEFT whole brain scan [20, 21] served as anatomical reference for coregistration and overlay of functional data (TR = 16.5, TE = 8, inversion recovery time 550 ms, FOV = 25.6 × 19.2 × 19.2 cm, matrix = 256 × 128 × 128). Preprocessing of each session included removal of imaging artifacts. The initial 10 images were discarded to ensure T1 relaxation equilibrium. Spatial preprocessing using SPM5  included motion correction by realignment, normalization to the MNI brain reference space , and spatial filtering with an 8 mm Gaussian kernel. Signal intensity was globally normalized for each functional image volume. Analysis of functional data began with a voxel by voxel assessment of contrast between the 2-back and the 0-back tasks under the general linear model , regressing against the n-back block time course with realignment parameters used as covariates. A group composite T-score map was then constructed for each sleep condition by random effects analysis  and overlaid on the subjects' average anatomical reference image. The small sample did not afford enough statistical power to make voxel-by-voxel comparisons across conditions. Instead, we took a region of interest (ROI) approach, using automated masks  to define two bilateral ROIs: a task positive ROI comprised of the dorsolateral prefrontal cortex and the inferior parietal lobes, and a task negative ROI comprised of the medial frontal gyri and posterior cingulate. Within each subject and condition, an activation score for the task positive ROI was calculated as the mean positive T-score for voxels in the ROI, and a deactivation score for the task negative ROI was calculated as the mean negative T-score for voxels in that area. We then applied a bootstrapping procedure for each ROI in each condition by resampling the voxel T values 1000 times (with replacement) to estimate the sampling distribution of the ROI scores, thereby allowing us to examine the possibility that differences were due to sampling error. N-back performance was comparable across the two experimental conditions (Figure 1). Consistent with prior studies (e.g., [18, 19]), in both conditions the 2-back task resulted in relative activation in task positive regions and deactivation in task negative regions. These are graphically illustrated in Figure 2 and indexed in Tables 2 and 3 by conventional label, Brodmann's area  and Talairach coordinates to serve as a baseline reference. Though the activation patterns were similar across conditions, the intensity of such activation/deactivation differed across conditions. Relative to HD, in the SR condition subjects showed greater activation in the task positive ROI and more deactivation in the task negative ROI (Figure 3). The estimated sampling distributions did not overlap across conditions, suggesting that the mean differences were not due to sampling error. Accuracy and reaction time were comparable across sleep conditions on the 0-back and 2-back tasks ( p > .10). SR = Sleep Restriction, HD = Healthy Sleep Duration. Composite activation/deactivation maps, showing contrast of 2-back task with 0-back task in each experimental sleep condition. Warm colors (orange to yellow) reflect voxels that are more active during 2-back than the control task, with a threshold of T > 3; Cool colors (blue) reflect relative deactivation during 2-back, T < -3. Slices shown are at -19, -15, -11, -3, +9, +11, +13, +15, +23, +37, +43, and +45 mm. Histograms reflecting results of the bootstrap resampling procedure across experimental sleep conditions. The panel on the left illustrates the greater activation in the task positive ROI during the Sleep Restriction (SR) condition than during the Healthy Sleep Duration (HD) condition. The panel on the right illustrates the greater deactivation in the task negative ROI during the SR condition than during the HD condition. L = left hemisphere, R = right hemisphere, B = bilateral. Clusters satisfy a significance threshold of p < 0.005 (uncorrected) and a volume threshold of 0.5 cc. Centroid locations are in Talairach coordinates. As the first published imaging study of the functional neural consequences of sleep restriction in a pediatric sample, this study provides important evidence of feasibility and preliminary findings in this understudied population. The adolescents in this study overall appeared resilient to chronic sleep restriction in their n-back performance, but their neural activation differed across conditions. Adolescents showed greater relative activation of the task positive attention network and deactivation in the task negative network after chronic sleep restriction than when well-rested. A compensatory cerebral response appeared to be elicited during sleep restriction  that may have helped focus attention and suppressed extraneous mental processes , resulting in relatively preserved performance. This is consistent with prior studies of adults, in which sleep-deprived subjects who maintain their performance on tasks that require concentrated effort show particularly heightened activation in the task-positive attention network, particularly low activation in the task-negative attention network, or both [6–12]. Future research will be needed to determine whether or how this compensatory response breaks down, as adolescents who have experienced chronic sleep restriction ultimately show reduced attention in applied settings . Based upon findings from prior adult research, one might expect a correspondence between task failure and attenuation or loss of activation in the task-positive network, relative activation within the task-negative network, or both [6, 7, 12–16]. Such an effect may not be unique to the sleep deprived state, as studies of subjects who have not been intentionally deprived of sleep have shown that task-negative regions are relatively more active when adults subjectively report daydreaming  or objectively display momentary lapses in attention . This study also illustrates the utility of a protocol that could advance research into the neuroscience of pediatric attention and its disorders. The most common approach to understanding neurological aspects of attention in children has been to compare those with known deficits to healthy controls, which carries potential confounds that can be difficult to disentangle. Our within-subjects experimental method could provide a less confounded tool for understanding attention network functioning under healthy and sub-optimal conditions. Finally, present findings demonstrate that it is feasible to examine functional activation patterns after chronic sleep restriction. To our knowledge, such research has not been previously published, despite the ubiquity of chronic sleep restriction among adolescents and its frequent occurrence in adults . Present results are consistent with the hypothesis that the cumulative effects of chronic sleep restriction are similar to those seen after acute sleep deprivation, but more research is needed to verify and elaborate upon our findings. Of note, it is not known how changes in functional activation unfold over the course of chronic sleep restriction; recent quantitative EEG results suggest region-specific, nonlinear changes in neural activity over the course of a week of restricted sleep in healthy adults . Findings from this study are considered preliminary because of several limitations, including the reliance on a single working memory task, the use of multiple scanners, and a fixed sleep protocol across all subjects. More importantly, the small sample precluded voxel-wise comparisons across conditions and diminished statistical power to detect effects on n-back accuracy or reaction time. Nevertheless, the within-subjects experimental design produced robust ROI-based findings and reduced possible confounds. If replicated, these findings have the potential to guide targeted palliative treatments for adolescents with refractory sleep disorders or sleep problems that are secondary to medical illness. Our findings also set the stage for future research investigating questions of reversible versus irreversible effects of chronic sleep restriction during brain development. Adolescents in our sample displayed a cerebral response to chronic sleep restriction that appeared similar to that described in acutely sleep-deprived adults. Although present findings have limitations, they provide important evidence of feasibility and guidance for novel lines of research into the functional neurological effects of chronic sleep restriction, the effects of pediatric sleep restriction, and the neuroscience of attention in children. This research was conducted with funding from the Cincinnati Children's Division of Behavioral Medicine and Clinical Psychology, and National Institutes of Health grants K23HL075369 and M01RR08084; neither organization altered the design of the study, conduct of analyses, or interpretation of results. DWB oversaw the project, directed the experimental sleep manipulation, monitored subject adherence to the sleep manipulation, conducted the behavioral performance analyses, and drafted the manuscript. MWD and SKH oversaw the collection of anatomical and functional imaging data. MWD also conducted primary imaging analyses, drafted portions of the manuscript, and had conceptual input in the research design and interpretation of findings. SJT and KAM assisted in data collection and contributed to manuscript revisions. SKH oversaw the imaging analyses, had conceptual input in the research design, and contributed to manuscript revisions. All authors read and approved the final manuscript.